I've been agonizing over this since the previous post, as well as researching it in neurological texts and in the cognitive sciences, commentaries on them, and in philosophy. I haven't found any especially satisfying references, so* I'm not going to try to back up my synthetic hypothesis with weighty authority. What I want to talk about is the past, the present and the future and how, or more specifically, when we experience them. 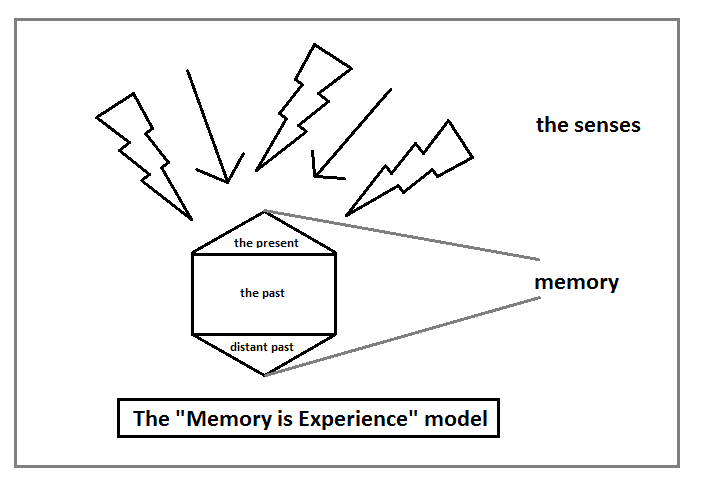 Below is my scribbled diagram of the "arrow of time" model of how we experience the universe. As a model of history, the hourglass is fine. When dealing with large timescales it presents no real problems. but at very small scales, it does. We experience events as a continuous flow, one thing happening after another; when I see a bird fly past my window, I know it has flown from west to east because even in the fraction of a second that it took, I remember that it appeared at the west side of the frame and disappeared at the east, and crossed my field of view on a continuous vector from west to east. I have a sensation of seeing a bird fly west to east because in each Present instant I remember the preceding Past instant when it was slightly to the west. At least, that's the hourglass theory. Consider laying the dining table. As you place a plate in each place, you hear the plate touching the table at the same time as you feel it touching at the same time as you see it touching. Sound travels at about 340 m/s. Light travels at about 300,000,000 m/s. Nerve impulses travel at widely varying speeds, though 100 m/s seems fairly typical. Even over the very small distances between the plate and your brain, the difference between the visual sense and the other two is very very large. Large enough that if we really experienced events in a single instant as they happen, people sitting in the back row at the cinema would experience a substantial lag between seeing the actor's lips move on the screen and hearing them speak**. Why doesn't this happen? This model leaves out the future altogether. When it comes to understanding our present the future is an unnecessary distraction. Indeed, you'll notice that I don't treat the present as a point here, because although in mathematics it may be, in epiphenomenology (the study of the nature of conscious and unconscious experience), the present is not a point. It's a sort of blur; your sense all get information at different speeds. Were pretty comfortable with the idea that the sense of smell is generally out of sync with the rest of the sense. My dog will chase a cat by following the cat's scent trail around the garden when the cat is in plain view in the middle of the lawn; the dog's present includes smell in a way that ours includes sight and sound; your brain is compensating for the different times at which the same information arrives by creating a lag; a lag that can sometimes be detected. What we call déjà vu is exactly this. And why? Because the only way that the brain can compensate for the variation in the speed of the senses is memory. We are continuously remembering the present. This is the only reason why reading works at all. As you read a sentence, the words go into a buffer, to be interpreted, converted into a memory of meaning, once enough of them are present for an experience sufficient to be remembered is formed. 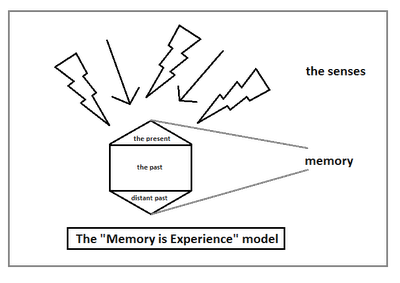 This is also the reason why jokes work; to save time (your brain is always trying to find ways to cut down on time and resources), you begin to predict what the memory will be before the joke is completed, but the punchline short-circuits your expectation, giving a feeling of giddiness as the memory has to change. One thinks of Jimmy Carr's infamous mosquito joke. Sir Hargen was uncomfortable in the saddle; he had set of half an hour earlier after a hurried breakfast of indifferent eggs, having roused unexpectedly from a deep sleep, dreaming of riding in a carriage. And here he was back on his bony old nag. It isn't always a good idea to do this, but it works. Once you've read the sentence you remember the events of Sir Hargen's morning in order. Going back to my earlier post, I believe that this is why Bob's technique works, and the reason why Adam's technique, when it does fail, does so so spectacularly, is because the memory does not have enough time or information to fully form in the reader. The reader literally can't remember the details. * oh all right: a nod to Daniel Dennett's "Consciousness <scare quotes>Explained</scare quotes>". The excellent Tom Stoppard play "Jumpers" includes a satirical treatment of the way that philosophers choose the titles for their books which seems to apply especially well to Dennett. But it is an entertaining book that certainly helps the student to think in the right way, (much like Wittgenstein), even if it doesn't really explain consciousness. ** in a big cinema, the sound would take something like a tenth of a second; easily detectable to us humans. The light would take a ten-millionth of a second; definitely undetectable.